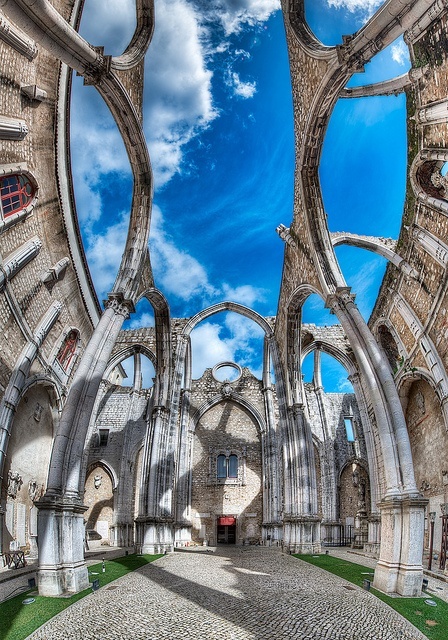 The Carmo Convent is a historical building in Lisbon, Portugal. The mediaeval convent was ruined in the 1755 Lisbon Earthquake, and the ruins of its Gothic church (the Carmo Church or Igreja do Carmo) are the main trace of the great earthquake still visible in the city. The Carmo Convent is located in the Chiado neighbourhood, on a hill overlooking the Rossio square and facing the Lisbon Castle hill. It is located in front of a quiet square (Carmo Square), very close to the Santa Justa Lift. Nowadays the ruined Carmo Church is used as an archaeological museum (the Museu Arqueológico do Carmo or Carmo Archaeological Museum). The Carmo Convent and its Church were built between 1389 and 1423 in the plain Gothic style typical for the mendicant religious orders. There are also influences from the Monastery of Batalha, which had been founded by King John I and was being built at that same time. Compared to the other Gothic churches of the city, the Carmo Church was said to be the most imposing in its architecture and decoration. The church has a Latin cross floorplan. The main facade has a portal with several archivolts and capitals decorated with vegetal and anthropomorphic motifs. The rose window over the portal is partially destroyed. The south side of the church is reinforced by five flying buttresses, added in 1399 after the south wall collapsed during the construction work. The old convent, located to the right of the facade, has been rebuilt in neo-Gothic style in the early 20th century.